Join us for a new Action Learning group forming at the REconomy Centre. Action learning can help you become more productive and focused in pursuing your livelihood, project, or enterprise. Action learning is a bit like having your coaching team or problem-solving think tank. Action learning ‘sets’ consist of between 5-8 people who agree to meet regularly. Everyone shares issues or challenges. Working within in strict guidelines and a trained facilitator, the ‘set’ quickly gets to the heart of the problem, identifying key actions necessary to overcome the challenge or solve the problem. Creating space to work through problems in a supportive, fun environment can lead to real organisational change and empower individuals in the workplace. It’s a proven process and is used by a wide range of organisations – KPMG, Disney, Christian Aid, and Devon County Council, for example. 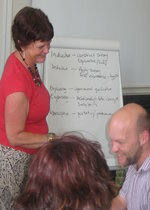 The REconomy Centre Action Learning group will be lead by highly regarded facilitator, Alison Theaker, from The Spark. She’ll be introducing ‘action learning’ at the at the REconomy Social, April 29th, 6pm at the Kingsbridge Inn. And she’ll be hosting a taster session at the Local Entrepreneur Forum on May 14th. The first Action Learning session will be May 21st, 9:30am – 12:30pm at the REconomy Centre, with the remaining 5 sessions in the series scheduled by agreement of the group. The first session is open to anyone with an interest.